Posterior urethral valves are a common cause of frequent UTI’s in young boys. Cystoscopy with PUV fulguration remains as the standard mode of treatment for this condition. We present here a case of a 4 years old male child with PUV who was fulgurated and subsequently developed a urethral calculus. Though PUV and Urethral calculi individually are very common entities, their combination is seldom seen. Posterior urethral valves are the most common cause of urinary tract obstruction in male neonates with an incidence of 1: 8,000 to 1:25,000 . The presentation of the valves can be antenatal, neonatal, in childhood or rarely in adulthood as well. Vesical and urethral calculi are very common in children of the developing countries, but the association of PUV with urethral calculi is uncommon. A 4 year male child presented with history of recurrent Urinary tract infections and nocturnal enuresis. General examination was normal. Routine blood workup and renal chemistry was essentially normal. Ultrasonography was unremarkable. VCUG was suggestive of a dilated posterior urethra (Figure 1). Patient was posted for Cystoscopy and fulguration of the posterior urethral valves was done using a Bugbee electrode. Post operative period was uneventful and patient was discharged on POD 2. 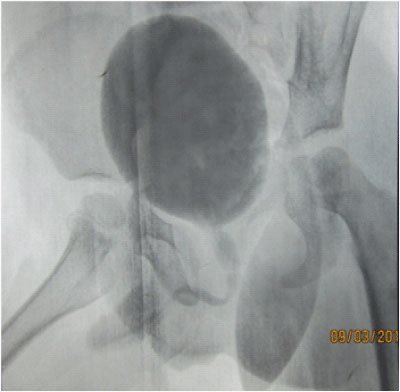 The patient subsequently presented 4 weeks after surgery with recurrence of symptoms like dribbling of urine and dysuria. Blood workup and renal chemistry was normal. X-ray KUB was done which was normal. Patient was posted for check cystoscopy to look for residual valves. The Cystoscopy however revealed a single calculus in the posterior urethra obstructing the flow of urine. The calculus was fragmented using laser lithotrite. Post operative period was uneventful and patient was discharged on POD 3. Figure 1: VCUG showing Posterior Urethral Valves. Posterior urethral valves are the commonest cause of urinary tract obstruction in male neonates . The widespread use of antenatal USG has enabled early diagnosis of PUV. The diagnosis is usually made before or at birth when a patient is evaluated for antenatal hydronephrosis or hydroureteronephrosis . Neonates generally present with bladder outflow obstruction, poor urinary stream, and urinary tract infection . Delayed presentation in childhood is not uncommon, in the form of recurrent UTI’s, nocturnal enuresis and dribbling of urine . Occasionally, PU valves can present in adulthood . Vesical calculi and urethral calculi are common causes of UTI and urinary obstruction in children in developing countries . Both these conditions can individually manifest with similar symptoms and clinical picture. Posterior urethral valves associated with urethral calculus is very rare and only handful of cases are reported in literature [6-8]. Patient reported back with symptoms consistent with residual PUV. Radiological investigations failed to demonstrate the urethral calculus which was eventually diagnosed on cystoscopy. The rapid formation of stone leads us to believe that the stone was preexistent secondary to the urinary outflow obstruction due to posterior urethral valves and was probably missed on primary Cystoscopy. Though etiopathologically different. Calculi in the lower urinary tract and posterior urethral valves have near similar presentation clinically, especially in cases of posterior urethral valves that present later in life. It is not unusual to detect posterior urethral valves in a patient with lower urinary tract symptoms in developing countries. Hence it is axiomatic to keep these two conflicting conditions in mind when evaluating any child with lower urinary tract symptoms. Arnold Coran (2012) Pediatric Surgery textbook (7th edn), Mosby Publisher, USA. Martin David Bomalaski (2014) Posterior Urethral Valves. Neulander E, Kaneti J (1996) Posterior urethral valves and vesicolithiasis in children. Int Urol Nephrol 28(4): 563-568. Sinha A, Sarin YK, Sengar M (2001) Posterior urethral valves associated with urethral calculi. Indian J Urol 18(1): 84-85. Atul Kumar Khandelwal (2013) Posterior Urethral Valve with a Bladder Stone: A Case Report. UroToday Int J 6(5): art 66. Acharya H, Dhende NP, Mane SB, Obaidah A (2009) Posterior urethral valves with vesical calculus: A rare association. J Indian Assoc Pediatr Surg 14(3): 115-116. Bomalaski MD, Anema JG, Coplen DE, Koo HP, Rozanski T, et al. (1999) Delayed presentation of posterior urethral valves : a not so benign condition. J Urol 162(6): 2130-2132. Posterior urethral valves; staghorn calculus and Vesico ureteric reflux rare combination in adult: case report.